On Wednesday, Dover and the South-East coast generally was visited by the most terrible storm which has happened since the memorable gale of 1877, when the Admiralty pier was partly swept away. The gale sprang up about midnight on Tuesday from the south-west, following upon an abnormaly rapid fall of the barometer, the wind increasing in violence up to three o'clock on Wednesday afternoon, from which time it abated. From 9 a.m. to 3 p.m. it blew with hurricane force. About mid-day the trains were scarecely able to move against the wind between Folkestone and Shorncliff, the fireman of the mid-day up train, walking a considerable distance in front of his engine, and placing shovelfuls of ballast under the wheels to obtain a grip. What would have hapened had it been spring tides instead of neap it is scarcely possible to imagine, but the destruction in all probability would have been most disasterous. The way in which the Admiralty Pier was swept by the sea is beyond anything which has ever been seen before under a similar condition of the tide. At low water the sea swept the Pier from west to east in a continuous stream of water. No serious shipping disasters were reported at Dover; the PIONEER, BARGE, Faversham, however, had a narrow escape, being at the mercy of the sea, when she was picked up by the Dover tug, and brought into Harbour. Damage to the roofs of houses in general throughout the town. The roof of a bakehouse belonging to Mr FLINT in Strond Street was wrecked, and at the Brussels Inn and another house in the Pier a stack of chimneys fell through the roof. At Lydden a carriage and pair of horses was completely overturned, one of the horses being injured. After the storm the streets were bestrewn with a large number of tiles, but no personal injuries have fortunately been reported. telegraphic and telephonic communication was generally interrupted. So bad was the weather that the Calais-Dover service of mail packets which are said to run in all weathers were very wisely not allowed to go to sea. The first boat to leave Dover left at 6 o'clock on Wednesday evening, a steamer also crossed from Calais late in the evening. The Club service was entirely suspended. The Steamer SAMPHIRE crossed in the morning making a terrible passage, and not reaching Dover until 6 a.m. although she left Calais late. Both the early Ostend boats reached Dover in safety. One of the steamers collided with the Pier and sustained some damage, but she left Dover for Ostend, taking mails only, at midday. Serious and extensive damage was caused at Folkestone by the hurricane. Slates and tiles were blown off the houses in all parts of the town, and in this respect Harbour House which stands on the sea-front suffered very much. Several portions of the roof at Harbour Station have been disturbed and a chimney shaft demolished. The chimney stack of Longford Hotel situated on the Lees was blown down upon the roof. In Langborne Gardens the damage has been very serious indeed. ; the tall chimney stacks of Nos.6, 7 and 8 Langborne Gardens were blown down smashing through the roof of No.8. The debris fell through all the floors to the basement of the house, which is a four storey building. Fortunately no one was seriously injured. The windows were nearly all smashed, and the interior of the house is a complete wreck. Great excitement prevailed in the neighbourhood at the time of the occurrence. The occupants left the houses, which were visited by hundreds of spectators during the day. As the housekeeper of Harbour House was proceeding into the street, she was overpowered by the wind and carried against the iron railings, and her arm was broken. The driver of a butcher's cart was blown off his seat and the cart overturned. Many similar evidences of the force of the wind have occurred. A large number of people congregated near the Sea Front about midday, when a small fishing smack, which had apparently been stripped of the whole of its sails, was seen to pass. It was impossible to discern anyone on board, and the vessel was carried out of sight. A very sad scene was witnessed at Sandgate. The full rigged ship BENVENUE, 2033 tons laden with a general cargo, and bound from London to Sydney, was proceeding down the Channel in charge of a tug; when off Sandgate she parted her cable tow-rope, and the vessel rapidly drifted ashore, This was about 6 a.m. when it was blowing a hurricane and a fearful sea was running. Seeing that his vessel was drifting ashore, the captain dropped his anchor, but that was of no avail; the vessel struck and settled down hard on the bottom. The dropping of the anchor had, as it happened, a very disastrous effect, and led to the whole of the crew being imprisoned in the rigging for many hours, as it prevented her from drifting right in shore, when his crew could have been easily rescued. The seashore at Sandgate which was literally bestrewed with wreckage, was crowded with thousands of spectators throughout the greater part of the day. When the vessel sank the captain and crew took to the mizzen top, and here they remained huddled together from 6 o'clock, so close to shore that they could see everything which was going on, and yet unable to obtain help of any kind. The hull at low tide was several feet under water, and at high water her lower yards were about 20ft out. All her masts and spars are standing, but except those sails which were furled, every stitch has been blown away. The vessel appears to be a fine craft as she lies there. The Sandgate coastguard were on duty from 4 a.m. and until dark continued the use of the rocket apparatus. A great number of rockets were fired, but from some cause or other every attempt failed. At midday MAJOR O'MALLEY and a party of no.52 Battery, Field Artillery, proceeded to the seashore with a 12-pounder breechloading field piece, and endeavoured by firing the gun to throw the rocket and line across the vessel, but the force of the discharge was so great in each case that the line was broken. From three o'clock no further attempts with the gun were made and the rocket apparatus was taken on to the foreshore and again used. The first shot was well aimed. Two of the figures were seen to emerge from the position in which they were huddled together and one man clambered down one of the ship-lines until he was almost wahed by the waves beneath him. Then some of the people were seen on the cross trees hauling; but after hauling some time the line proved to be broken. All the subsequent attempts were unsuccessful in reaching the ship. The poor fellow who discovered the rope appeared to have great difficulty in returning and was helped back by some of his ship-mates as soon as he got within their reach. A report was current to the effect that a man was washed ashore at Sandgate on a piece of wreckage, but before help could reach him, he lost his hold and was lost. Although thousands of anxious and willing hands were so near the vessel no help could reach the persons on board; the rockets fired all failed; and no lifeboat could be obtained. There was such a terrific sea running that it was imposible for any boat to approach the ship. The SANDGATE LIFEBOAT had capsized, and the DUNGERNESS and LITTLESTONE boats were engaged on other wrecks. A telegraph was despatched to Dover for assistance, and a gallant attempt was made in the face of a terrible sea to get the lifeboat off, the GRANVILLE TUG (Capt. LAMBERT)acting under the orders of Mr JAMES DURDEN, the Harbour Master, taking the boat in tow. Upon reaching the Admiralty Pier it was found impossible to face the heavy seas, and both boats were driven away to the eastward, returning to the Harbour later in the afternoon. 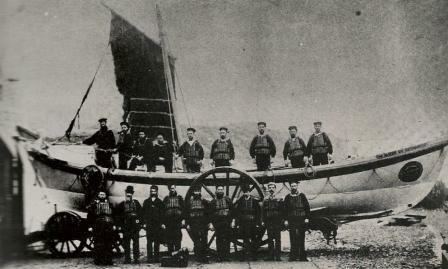 At night the greatest excitement prevailed on the seashore at Sandgate, and a crew was again mustered at Dover, and Mr DURDEN sent the lifeboat down in charge of the tug to make another attempt to rescue the crew. The crew were ultimately rescued by the SANDGATE LIFEBOAT at 9.50. A fresh crew was obtained about an hour previously, and after considerable delay in launching, the boat was got into the water precisely at nine o'clock. The rescue party was a scratch one made up of fishermen from Folkestone and some coastguards. She stuck to the beach for some time, but there were hundreds of willing hands at the ropes and behind her, and as she at last glided into the water a cheer was given by some thousands of voices. The lifeboat weathered one or two heavy seas, but within ten minutes she was alongside the wreck, and the work of rescue was begun. 27 persons being saved, no women as was supposed being amongst them. The DOVER LIFEBOAT arrived in charge of a tug a few minutes afterwards, but too late to be of use. The shipwrecked crew was in the rigging exactly 16 hours. The enthusiasm at Sandgate and at Folkestone when the men were landed was intense. A very great credit is due to the crew of the DOVER LIFEBOAT, who under such circumstances bravely volunteered to proceed to the wreck, although it was evident before they made their first attempt that it would be a physical impossibility to get down Channel. The coxswain of the lifeboat was Mr JAMES WOODGATE, and the following formed the crew: E SPICE, G IRONS, H MILLINGTON, C SAUNDERS, J POTTER (assistant coxswain), T BROCKMAN, F WHITMAN, J BETTS, F RICHARDS, F IRONS, E EALDEN, G RICHARDS, J RICHARDS, and W COLE. The same crew manned the lifeboat in the afternoon, with the exception of J DAY, A HOGBIN, J CLARK and S HALL. 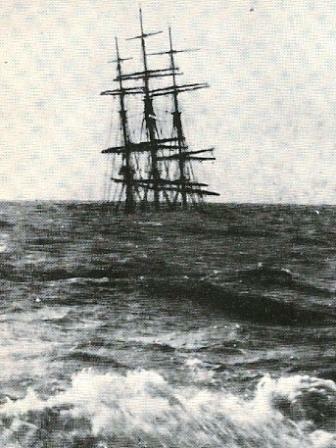 The French Schooner EIDEN was dashed against the Seabrook sea-wall and became a total wreck just before the BENVENUE ran ashore. Four of the crew succeeded in reaching the shore, and were subsequently forward to the Dover Sailor's Home. The captain, his wife, and nephew were drowned. Shortly after mid-day the body of a woman apparently about 35 years of age, was washed ashore at Sandgate opposite Gloucester Terrace. The face was much bruised. The body was removed to Durnford-cottage, Sandgate where it was subsequently identified by the survivors. The scene at the identification was a truly affecting one and those present were deeply moved. The body was taken charge of by Mr MAXTED, the superintendent of the Kent County Constabulary, stationed at Sandgate, who stated that during the 15 years he had been stationed there he had never experienced a storm of such violence. The rocket apparatus was in charge of CHIEF OFFICER ONSLOW, stationed at Sandgate. Some exciting scenes were witnessed at Ramsgate. At 4 o'clock the LIFEBOAT BRADFORD, under COXSWAIN FISH put out in tow of the steam TUG AIDE in answer to signals of distress. While they were gone a ketch went ashore near the North Break buoy, just off the town. The DEAL LIFEBOAT went to the rescue of the crew, who had left the vessel in their own boat. They were taken into the lifeboat just before the ketch sunk, and the lifeboat then anchored off the pier, having failed to make the harbour. The tug being away, no assistance could be rendered them, and they at last ran down and were landed at Broadstairs. meanwhile, a large ketch making for Ramsgate harbour, took the ground at the back of the West Pier, and afterwards drifted round onto the sands fifty yards behind the East Pierhead. Four of the crew were taken off by the harbour surf-boat, and the position of the others became very dangerous. Rockets were sent up as a signal for the tug and lifeboat to return, and attempts to reach the vessel by means of the rocket apparatus and baskets were made. Owing to the strong wind these failed to reach, and the attempts had to be abandoned. The tug and lifeboat returned and signals were made to them that their services were required. Amidst loud cheering, the tug towed the lifeboat up to windward and then let her go but she missed the vessel and drifted down to leeward. The excitement on the pier was now intense; thousands had assembled and eagerly watched the scene in spite of the heavy waves which washed over the pier. The wreck was swept by the heavy seas every few minutes. Another attempt was equally unsuccessful, and then the lifeboat tried to row up to the vessel. With the aid of their 'foresail they three times almost touched the wreck, and were loudly cheered each time. At length with considerable difficulty, the crew, four in number, were saved by the lifeboat, which then drifted awat to the leeward again, and nearly ran ashore on the sands. The rudder was damaged, but fortunately, they succeeded in keeping off, and were picked up by the tug, which towed them round into the harbour. There amidst loud cheers from the very large crowd which had assembled, the men were landed. The vessel was the TOUCH NET of Hull. The chief mate of the BENVENUE (Mr SAMUEL WEBSTER) was interviewed by the reporter on Thursday morning at the Queen's Hotel, where he was located with nine of his fellow survivors. His face bore a very haggered expression, and he stated that he lived at 33 Lindley Street, Sidney Street, London. The BENVENUE, which was an iron ship of 2,033 tons, left London on Tuesday morning with a general cargo for Sydney. They proceeded down channel in tow of a London tug, the name of which he could not recollect. All went well until they reached the South Foreland, when the wind blew very hard from the south-west. At nine o'clock the gale increased, and by the time they arrived off Sandgate the vessel became quite unmanageable. The wind was blowing a hurricane, and a fearful sea was running. It was a blinding storm. They deemed it advisable to drop both anchors, but even these with the assistance of the tug were not powerful enough to hold the vessel, and she drifted in towards the shore at Seabrook. When they were with a few hundred yards of the beach they heard a tremendous crash and concluded that the ship had struck. She commenced to sink at once, and in less than fifteen minutes she had disappeared beneath the waves. He did not attempt to lower boats, for a small boat could not possibly have lived in such a sea. As soon as he saw that the vessel was sinking he shouted to everyone to get up the rigging as quickly as they could, whilst he rushed below and fetched a rocket for the purpose of signalling for assistance. They all climbed up into the rigging and secured themselves as best they could, some of them got on the top sail yards, and secured themselves with lashings from the sails. They saw them trying to launch the lifeboat from the shore, but even if they had succeeded in getting out to them he did not believe they could have got off. Most of them thought it was all up with them when every attempt to rescue them failed, but he put his trust in the rigging and the mast for he knew they could never go until the vessel broke up altogether. Although they remained in such a perilous position for so many hours, and were well nigh exhausted they were somewhat comforted by being able to see the people on shore, and the attempts which were made to rescue them. It was a miraculous thing that they had not all drowned, and if the other poor fellows had done what he told them he believed that they would have been amongst them now. Immediately he saw the vessel was sinking he told them to get into the rigging and make themselves secure , but those who were drowned came down out of the rigging and were unable to get back again. It was too late. The vessel had gone too far down. He thought their idea originally must have been to jump overboard and swim to the shore, but that would have been quite impossible in such a boiling surf. Two apprentice boys, named BRUCE of Gravesend, and IRONMONGER of London, were drowned, also ARTHUR SWANAGE, the steward, CAPTAIN JAMES MODDREA, of Liverpool, and an able seaman named CHARLES WINTER. He (the chief mate) saw them all swimming with their life-belts with the exception of the captain, MR WEBSTER went on to say that when he came up from below with the rocket he saw the Captain and helped to get him into the rigging. Some of the men hauled him up with a rope, but when he looked round he saw that he had gone down again and went towards the cabin. As soon as he got to the cabin door the deck was under water. The hatches and deck began to burst up, and the force of the water running into the cabin carried the Captain in and he was seen no more. The vessel lay with six or seven feet of water above the decks. He saw the poor little fellow Bruce swimming about with blood trickling down his face. he thought the poor lad had been dashed against the side of the vessel. He also saw one of the men swimming towards the shore, and when he got about midway he saw him throw up his arms and disappear. Rockets were continually fired from the shore, but they were of no avail. Several of the men were struck by them. WM. DACEY received a severe wound on the hand, and EVAN EVANS was also struck on the hand and left arm. Several of them have marks of the rocket line across their face and hands and one man has a very severe cut in the face. The chief mate further stated that he had lost all his personal belongings to the value of £100. The rest of the men had lost their clothing and belongings, having nothing beyond what they stood in. ALBERT MOORE, an able seaman states that he caught hold of the captain's arm shortly after they had gone in the rigging, and helped to pull him up. The ship was then settling down rapidly, and a huge wave swept violently clean over the decks. The captain suddenly shouted out "Oh that pipe!" and jumped down again on to the deck. He went towards the cabin, and as soon as he got there the vessel went under, and the captain was sucked into the cabin by the tremendous force of water which was rushing down. That was the last they saw of him. EDWARD MCKINNEY, the boatswain, who was amongst the 17 survivors at MR LOCKIE'S Restaurant, states that many of them had great difficulty in clinging on to the rigging, their hands being fearfully blistered, whist some of them wrapped themselves in the sails. He got on the mizzen topmast with the chief mate and three seamen. They were lashed on with ropes which they took from the sails. The others fastened themselves on to the yards. They all suffered considerably from want of food. He had nothing to eat from Tuesday evening at tea-time until Wednesday night when he was taken to MR LOCKIE'S where they had received every care and attention. During the morning, the survivors drew up a memorial which was signed by the whole of the men, in which they expressed their desire to tender their heartfelt gratitude for the manner in which the crew of the lifeboat went to their assistance when all hopes had vanished, and also for the kind way they had been treated by the people of Folkestone, especially at the Queen's Hotel and the Harbour Restaurant. On Thursday afternoon a special service was held at the Parish Church, at which the survivors of the BENVENUE were all present. The fact was made known in the town by means of the Town Crier, and there was a very large congregation present, the men being objects of much interest and sympathy. The service was of a very appropriate and affecting character, and an offertory was made on their behalf. Prayers were read by the REV. H.D. DALE and the hymn "Eternal Father, strong to save" was sung, the congregation kneeling. The vicar delivered a brief address to the men. He asked them what were their thoughts during those long hours that they spent clinging to the rigging? They must have thought of all the dear ones they had left behind - their wives, their children, a sister, a brother, whom they might never see again on earth. Then their thoughts might have been very solemn ones. Some recollections of their past life, the things that they ought not to have done, and the things that they had left undone, must have flashed across their minds. Some of them, perhaps made solemn resolutions that if God spared them to return to their homes their future life should be better than their past. If any of them had not had not made those resolutions, he implored them to make them then. If any of them should go to sea again, he prayed that they might not indulge in blasphemous language, nor take God's holy name in vain, but that they might follow in their Saviour's footsteps. The 150th Psalm was chanted, and this was followed by the hymn "Now thank we all our God". The REV H.D. DALE having red the General Thanksgiving, the Vicar pronounced the blessing. The offertory amounted to £35, which was subsequently increased to £40, which was divided among the crew at the Queens Hotel in the afternoon. The boatswain thanked all for the manner in which they had been treated in Folkestone. he was sure the men would never forget it. He proposed that £10 should be put away for the steward's widow, a proposal that evoked loud applause. That left a little over 23s to each man, but the Vicar proposed that they should have 25s each, he generously offering to make up the deficiency. The men were placed under the charge of MR F JARVIS, the local Hon. Secretary of the Shipwrecked Mariner's Society, who has served them all with new clothing, and provided for their comforts in every way. Several of the townspeople rendered assistance, especially MESSRS. CHAS. PAYER, S. JOSEPH, and WALTER JOSEPH. The names of the survivors are as follows:- SAML. WEBSTER, ALBERT MOORE, EVAN EVANS, PETER CAULSEN, DAVID GOLDIE, JOHN MALAN, CHARLES STEPHENS, WM. DACEY, EDWARD RICHARDS, EDWARD MCKINNEY, HERBERT BREIGLAW, MARTIN ANSON, JAMES NELSON, JOHN SMITH, JOHN MURPHY, WILLIAM WILLIAMS (the carpenter), FRANK BROWN, JOHN BROWN, PETER STRICKMAN, ALFRED TOWNER, WILLIAM PRETEJOHN, JOHN HARVEY, SIDNEY BENSON, HUGH M'DOUGAL, EDWIN CHARLES and JOHN OWEN - 27 in number. The crew of the lifeboat who saved the men have received many complimentary messages from prominent persons upon their humane conduct. Amongst the messages was a telegram from SIR EDWARD WATKIN, informing them that he had dispatched a cheque for £10 as a reward for their bravery. The crew will also receive £100, which was left by MISS DE ROTHESCHILD (who presented the boat a few years ago) for the crew which made the first rescue. The crew was made up of the following Folkestone fishermen:- HENNESSEY (Coxswain), SADLER (Second Coxswain), JOHN CORRIE, DAVID PHILPOTT, ROBERT WHETHERHEAD, ROBERT FREEMAN, THOMAS MOORE, WILLIAM MOORE, ROBERT FAGG, THOS. NEWMAN, SMITH, MEES, GRIGGS, WILLIAMS and CUELCH. About nine o'clock on Thursday morning two seaman's chests were washed ashore at Folkestone, and were identified as belonging to the BENVENUE. The men left Folkestone by the tidal train on Thursday afternoon, the South-Eastern Company giving them free passes. A large quantity of wreckage has been washed ashore at Folkestone and Sandgate from the BENVENUE, and yesterday coastguards had no less than six seaman's chests in their possession. At low tide yesterday the wheels of the BENVENUE could be clearly seen above water. She is lying in very shallow water, and it is thought that the principal part of her cargo, which is very valuable, will be recovered. Hopes are also entertained of possibly raising her. The directors of the South-Eastern Railway have voted the sum of £20 for the lifeboat's crew. The National Lifeboat Institution will hold an inquiry as to the lifeboat disasters at Dymchurch and Hythe next week. SIR EDWARD WATKIN has promised to have medals designed and struck to commemorate the gallant deeds of the crew of the lifeboat, and will also cause enquiry to be made as to why the South-Eastern LIFEBOAT JUBILEE was not sent to render assistance. If she is not properly adapted for such emergencies he stated that he will have the necessary alterations made in her to perform the services she was constructed to render. Our Deal correspondent states that there were five hands on the Deal LUGGER SUCCESS, which was lost near Dymchurch on Wednesday. The boat was cruising for vessels requiring North Sea pilots, and was trying to hold to her anchor at Dungerness roadstead, when she was driven ashore. Three of the crew named ERRIDGE, FINNIS and BUTTRESS, succeeded in reaching the shore, but JOHN GRIGG (the master) and a man named PHILPOTT were drowned. Both men were married, and one leaves a family of four children. Much excitement was caused at Dover yesterday (Friday) morning by the sinking of the S.S. LEIBENSTEIN right in the mouth of the Harbour. The vessel which belongs to Bremen, and was bound to Stettin, with a cargo of oilcake, sustained severe straining in the great storm of Tuesday and Wednesday, and upon arriving at Dover on Thursday put into the Bay to obtain repairs. She, however was driven on to the rocks. Both Harbour tugs and a number of boatmen were employed yesterday morning in getting her off. It was then found that she was making water very fast in her fore compartments and the tugs which had charge of her attempted to get her into the Harbour; before they succeeded in doing so she sank right in the Harbour mouth, where she now lies. A large number of people have assembled. The vessel lies in an extremely awkward position, and unless she can be shifted will greatly endanger vessels entering and leaving the port. Should the wind increase there will be great danger of her being driven into the North Pier. The steamer is a vessel of about 2,000 tons register. In his book Howard Biggs describes this rescue much in the same way as the newspaper report. However, there is some additional information of interest. Ned East, Mark Elliott, Wright Griggs, Patrick Buckley, William Griggs, Henry Burton, Harry Griggs, Joseph Fielder, Jesse Goodsell, Albert Oaten, Jack Kneale, Fred Goodsell, James Jago (Sandgate), Charles Fagg, Jock Hennis, Thomas Doolan, Day. 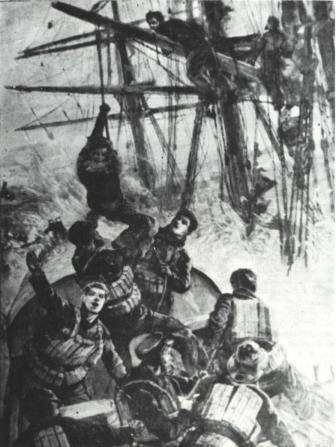 A total of 20 men) but the boat overturned in the breakers (Note: Elliott, Fielder, Oaten and Doolan managed to sramble back into the lifeboat when she righted herself and they dragged in Hennessey) and "bruised and exhausted, he helped to drag his men to safety but in spite of all efforts, one was lost." The man lost was CHARLES FAGG. At 9 p.m. Coxswain Hennessey managed to launch successfully with the Folkestone crew, and take off the 27 survivors. The boat was so overloaded that several of the lifeboatmen hung on to lifelines overboard on the homeward leg. 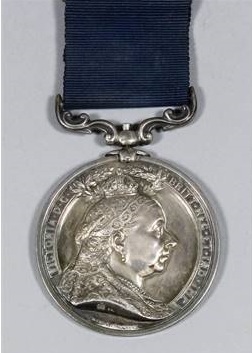 Queen Victoria was so impressed by this rescue that she granted permission for her profile to be on a special medal struck to mark the rescue which was awarded to each member of the crew. LAWRENCE HENNESSEY was awarded the Albert Medal 2nd Class and Second Coxswain ALBERT SADLER received the Silver Medal of the R.N.L.I. It was a common error in my family to believe that Coxswain Stephen Cook was at this rescue. 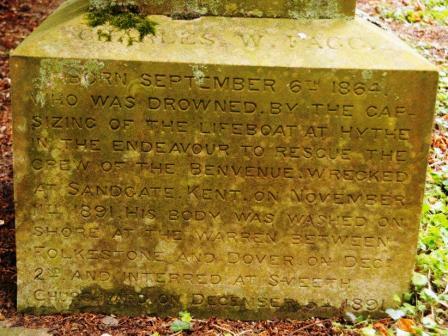 However this was not so and I believe the family mixed this famous rescue with that of the "Good Intent" described on the Folkestone Lifeboat page. My Aunt had this photograph of a drawing of the rescue of the Benvenue A Victoria Silver Medallion – the Folkestone, Hythe and Sandgate medal for the rescue of the crew of the Benvenue 11th Nov 1891. Sir Edward Watkin a director of the South Eastern railway made monetary awards to the rescuers and decided that a medal should also be awarded. His wife undertook the design of the medal, the dies of which where prepared by Sir Alfred Gilbert (1854-1934). The medals were manufactured by Heming & Co, London and were presented on 1st Jan 1892 by The Mayor Mr. S. Penfold, with copied paperwork of a full report of the rescue. Church Yard on December 5th 1891.
before 1881. He was serving as a Customs Officer at the time of his death. 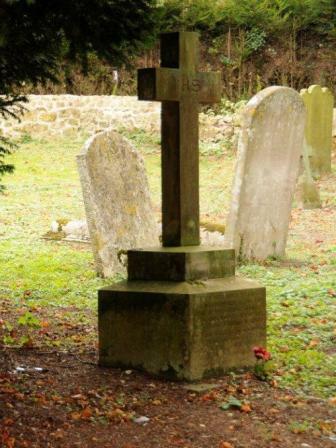 With many thanks to Chris Roche for these Photographs from Smeeth Church yard.